When we talk about the inner child, we’re referring to an image of your child self. This image may be one that you access by looking at a photograph of yourself as a child, or simply by closing your eyes and picturing yourself as a child. This is an image of yourself that matches with a certain time in your own past. This child can help you find and access memories and feelings that will help with your healing. S/he may appear sad, lonely, lost, afraid or deeply hurt. In some cases, to give you information about your emotional state your brain might give you a surprising image that is confusing at first. Years ago, when I was doing some of my own healing work, I saw an image of myself as a child that was both surprising and very helpful. I saw myself at the age of about four or five years, walking around looking kind of lost under a glass floor in my family’s home. This image of my child self represented the part of me that never felt seen, heard or recognized. This spontaneous image was very helpful to me in my healing and self-understanding. Trust your mind to provide you with the images of your child self that will inform you about the inner work you need to do. While the inner child of the past helps you with your healing, the inner child of the present helps you with your self-care on a current and ongoing basis. In order to get clear readings from the present child, the child of the past must have some degree of healing already accomplished. In other words you won’t get accurate readings about your present emotional state from the child image until the inner child of the past is relatively nourished and healed. The work you have to do with the past child will fade over time, and the relationship with your inner child of the present will grow stronger, deeper and more enjoyable. Use this aspect of the child within by checking in on a regular basis to see how you’re doing emotionally. Just close your eyes and picture yourself as a child. Depending on your inner clarity and where you are on your healing journey, this image will tell you something about how you are faring emotionally, right now. Some of the images of your inner child can be a kind of bellwether for you, indicating future possibilities for your development and self-expression. Here are some child images to consider about your inner child of the future: The divine child. Carl Jung refers to the divine child as one of the archetypes in some of his writings (C. Jung and C. Kerenyi, 1969). One of the definitions of the word “divine” is simply “from God.” If you believe we come from God, or the Creator of the Universe, then you can accept this idea. The divine child is radiant, pure, innocent, open and vulnerable. The divine child remembers where s/he came from, and never loses the connection. This is an image of our inner spiritual nature. This reconnection with the divine is the reward for your inner journey of healing, and can be seen as a doorway to a deeper and more fulfilling connection with your Creator. This image of the child suggests a wellspring of energy. From this wellspring emerge your humor, spontaneity, creativity, joy and capacity for unconditional love. This is in some ways just another way of looking at the divine child, as these qualities too are the reward for your journey of self-discovery and healing. 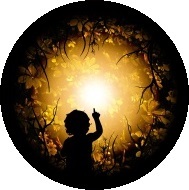 The magical child also provides a doorway to wisdom and undeveloped powers, suggesting a connection between the child and the wise elder that also lives inside each of us. Think of exuberance, light, energy and unabashed self-expression. This image can be seen as the magical child in action, bringing varieties of physical playfulness into everyday behavior. Since most of you had some opportunity to play as a child, accessing this part of yourself is a matter of remembering. For others of you who never had the safety in your home to play, you may have to learn how to play for the first time. Children and animals are your best teachers. Also, some adults may actually be able to help you! As you heal, grow, expand and develop into the magnificent, brilliant being you were meant to be, all of the wonderful aspects of the child become diffuse throughout your mind, body and self-expression. In other words, the wonderful child aspects and qualities we are discussing here are available to you as an adult at any given moment on any given day in any given situation.